I am a cottage style gardener. My flower gardens are not formal. I like to mix annuals, perennials and garden junk. My only rule is "taller in the back and shorter in front". 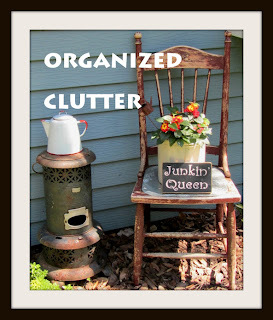 The junk serves two purposes, vertical interest and visual interest. A flower bed is just far more interesting and pleasing when there is some height, and varying heights. Plan a garden! Plant a garden! It's fun! I have made mistakes in design and just moved the plants the following year. This photos is from the curb appeal post. The lilies weren't in bloom yet but the nasturiums were gorgeous. After all the rain I had to deadhead almost all of the blossoms off! Love, love, love, love, love it!!! You gave me many ideas. Thanks for sharing!!!! This is wonderful I am going to share on the From the Farm FB page and my page of course. It is so detailed. You are a one woman gardening guide. You are a girl after my own heart. I love to mix old pieces in with the garden flowers. I love the feel and vibe of old vintage pieces with the flowers too. Oh I love your little angel bird house on the chair. Where did you get her. I love that piece. I hope you bought here somewhere where there are more. I would love to have that for my garden. She is beatuiful. Loved all your pictures. Gorgeous. Your gardens are amazing Carlene! When do you move your plants? I've got some taller in the front that need to be moved, but I'm never quite sure when to move them. Your garden is absolutely beautiful! You are incredibly creative between the types of flowers and placement as well as the type of "junk" and placement too. It's gorgeous! Your gardens are amazing, Carlene! Thanks for the names of your flowers. I'm going to have to go back and look more closely for ideas to use in my gardens. Oh wow, I love cottage gardens! Yours is beautiful. I'm working on mine but it will take another year or so. Patience! Enjoy all your time in your pretty space, I can tell you are out there alot and it shows. Amazing! Your gardens are very artistic, fun, colorful, and best of all, inspirational! Thank you so much for putting this post together! I adore your gardens Carlene! You have created the most lovely cottage garden. I love how you marked things, I actually don't always remember what I planted, but I am learning. So much better than our snow views a few months ago. So beautiful Carlene! There are so many plants on your list that I didn't even know! You are so good at this...you should be a consultant! What am amazing garden Carlene! You've designed it so beautifully, and love the mix of garden art. Gorgeous! I have to take a closer look to see what I have already and what I can add to my garden! I just don't know how you do it ... lovely ... and you know the name of all the plants ... I can never remember the names. Thanks for sharing. What a beautiful garden you have. I can see that it took a lot of planning and I love all the details.